It’s that time of year again. Africa’s premium Hip Hop festival, Maftown Heights, highly anticipated line-up for their seventh annual festival spiced up by KFC which is set to take place on Friday, November 25 Friday at Mary Fitzgerald Square, Newtown, Johannesburg from 15:00 until 02:00. The second batch of names will be released at the beginning of November. 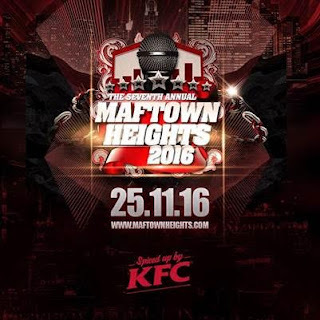 The must attend seventh edition of Maftown Heights will once again be spiced up by KFC as they return as a headline sponsor for a second consecutive year. Maftown Heights continues its media partnership since inception with YFM and Channel O. With just over 10 000 attendees at last year’s Maftown Heights installment, patrons are encouraged to purchase Early Bird tickets as early as possible to avoid disappointment as these tickets are limited. Tickets are available at Computicket and Shoprite stores at various prices.